However, there are times when you’re tired, too tired to hike all day in the high mountains. There are also times when the weather is just too lousy for a long hike. But, on the other hand, you don’t want to spend your precious vacation day in bed. You decided to travel this far to explore hiking trails in High Tatras and now it’s raining? Fear not, for I have an offer for you! A very pleasant, nice and easy trip which you will certainly like a lot! 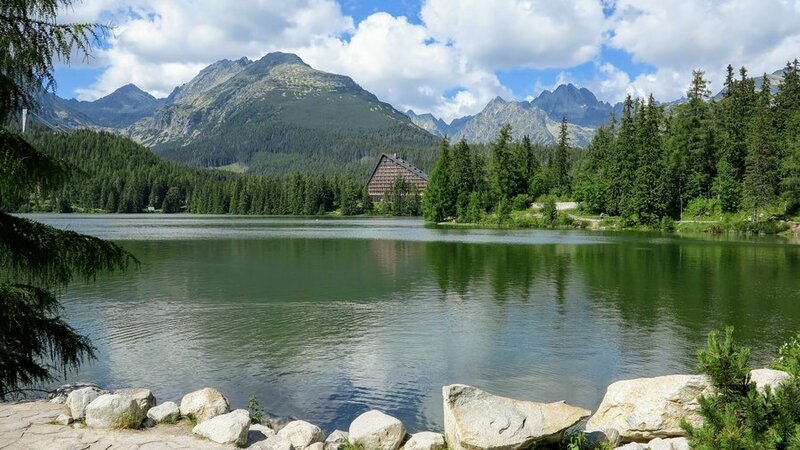 What I want to recommend here are two picturesque ponds in High Tatras - Štrbské pleso and Popradské pleso. They are the best places to visit in Tatra mountains for families with children. This route is short and easy, perfect also for families with children. What I like about it is that it gives the chance to admire the high mountain landscape without long and tiresome ascend. Such hiking trip is also a great idea if you already saw those lakes while hiking to Rysy (the highest mount in Poland) or Kriváň peak (Slovak’s national mountain), but there wasn’t enough time to contemplate those places properly. You just run beside those ponds like a lightning (“I’ll see it next time, now I need to go see real mountains” ), or you were just too tired after a whole day of hiking to stop by and enjoy circular path around the lake (it was me). Blue trail starts nearby Električka tram stop (1245m). Tram line: Poprad - Štrbské Pleso. There’s also parking lot close to the trail (8 EUR per day), but it often gets crowded - it's a starting point for many hikers who plan to climb Rysy peak. They say that Popradské Pleso lake is Slovak counterpart of Morskie Oko (the most popular lake in Polish Tatra National Park). Both ponds are beautiful, surrounded by majestic rocky mounts. There is mountain hut nearby each of those lakes and both are easily available. There’s actually only one difference - Popradské Pleso is definitely less crowded than Morskie Oko, despite the fact that the trail to Slovak pond is much shorter. The road leading to Popradské Pleso mountain hut was built in 1886, but only after World War II, it became asphalt road. I prefer dirt trails, but at least this part is fast to hike (just 4km and about 260m of height difference). At the very beginning of our trip, we cross the Poprad river, which, after about 155km, enters the Dunajec river. The trail is nice and easy, gently ascending to the north. We pass a few serpentines and we enter Popradská Polana clearing from which we get to admire craggy walls of Tatra mounts. Then we see a signpost offering two options: asphalt road leading to the mountain hut and yellow trail leading to Symbolic Cemetery. I highly recommend hiking on the yellow trail (we will get to the hotel anyway). Creation of this Cemetery was the idea of painter and alpinist from Czechia - Otakar Štáfl. He came up with it in 1922, but the official opening of Symbolic Cemetery took place in 1940. They started the project by gathering memorial plates located in many different places in Tatras. Such boards were put in the mountains by family and friends of the people who died in accidents. TANAP workers kept adding new memorabilia and the cemetery got bigger over time. At the moment there are about 300 memorial plates which remind about those who are left in Tatra mountains forever, and also alpinists who died in other mountains, but were closely connected with Tatras. The motto of the cemetery is: to commemorate the dead, to warn the alive. There are many renowned Polish names: Wanda Rutkiewicz, Jan Długosz, Klimek Bachleda, Mieczysław Karłowicz, Jerzy Kukuczka, Władysław Cywiński. All of them loved the mountains deeply and weren't able to imagine life without climbing. Entry to the Symbolic Cemetery is free of charge, however, in high season there might be volunteers collecting donations for maintaining this unique place. After visiting the Cemetery, there’s no need to return to the asphalt road, as the yellow trail leads us to the lake. There’s a convenient stony path which encircles eastern part of Popradské Pleso. The lake is located on 1494m (100m higher than Morskie Oko pond), but, because of its southern exposure, the plankton is more abundant and fish are bigger there. Popradské pleso mountain hut is big, but pleasant to look at - it’s built in typical style of Tatra mountain architecture. First mountain hut in this place was built in 1879, but the current building was finished in 1961. Actually, it’s more of a mountain hotel than a shelter, as it offers a wide range of accommodation, suitable for different types of customers’ needs. So, we may get there comfortable apartment, cozy room with bathroom, room with basin, and also (if we look for budget option), there’s a bed in shared room with bathroom in the corridor. When the hotel’s very busy, they offer a place to sleep in the attic in a shared room. Most importantly, there are bathrooms available (not every mountain hut in Slovakia has such luxury), and also tourist kitchen (access costs 8 EUR). The trail which connects both those lakes is only 5km long (height difference is barely 200m), but it offers a fantastic view on Mengusovská and Zlomisková valleys. This makes it very popular among tourists. To avoid crowds on the trail, it’s best to set off as early in the morning as possible or go for an evening walk. After short forest part, the path turns into the flat and convenient pavement and leads us on 1500m, high above Mengusovská valley. Brilliant! No wonder that KČST (Klub československých turistov) which built this trail in 1935, considered it as a role model of a mountain trail. Additionally, there are information boards along this trail, which makes it a didactic path. Unfortunately, the red trail crosses a few gullies, from which avalanches may fall, so it’s recommended to use green trail in winter. When there’s high avalanche risk, it’s advisable not to hike in this area at all, because even green trail doesn’t guarantee 100% safety. In 1974 a great tragedy happened - enormous avalanche got to the point where the green trail crosses with the blue trail (asphalt road) and carried away 24 people. Unfortunately, half of them was killed. It occurred barely 400m from the mountain hut. Anyway, let’s get back to summertime, which allows hiking there with no risk and we’re free to admire stunning mountain panorama. The trail runs along rocky slopes with some spruces, larches and pines growing randomly here and there. During our hike, the forest gets denser and for a few moments, there is no landscape to admire. But fear not, for the trail starts to descend, forest thins and we get to admire beautiful surrounding of Štrbské Pleso pond. Štrbské pleso lake is located on 1346m and is encircled by a wide pavement, which is usually full of tourists who stay in the nearby hotels. This path is 2.5km long and going around the lake takes about 45 minutes of a relaxed stroll. In XIX century there was already a village nearby the pond (which had the exact same name - Štrbské pleso). In 1885 it attained health resort status. The terrain around the lake is as flat as a pancake, so hotels there were springing up like mushrooms (it’s a total coincidence I used so many food comparisons in one sentence 😉). It’s worth to note that Štrbské pleso resort isn’t just a lake with a few hotels pushed between Tatra mountain alps. It’s actually a popular Slovak health resort offering a beautiful panorama of Tatra mountains. Štrbské pleso is the highest town in Tatra mountains. In my opinion, it’s also the most expensive one. Accommodation is very costly and prices in shops are higher than those in Vysoké Tatry town. It may be caused by the fact that Štrbské pleso is very popular among skiers and patients looking for fresh air. One of the best hotels in High Tatras is Hotel Panorama Štrbské pleso. It's a modern and comfortable hotel, located just 100 metres from the lake. It's not cheap, but very pleasant to stay in. It has SPA facilities and is a perfect place to regenerate strength after a whole day hike. Breakfast is included. However, a lot of hikers prefer to stay in nearby village Štrba. It's situated a bit lower than Štrbské pleso (850m), but accommodation prices are lower too! It's still located as close to hiking trails as possible, so it's a good option if you wish to explore hiking trails in High Tatras. There’s also cog railway stop in Štrba from which we can get to Štrbské pleso, so it’s fast and easy to travel between those two places. This railway is called zubačka. You can check the timetable and buy tickets on Slovak rail website. To sum up, hiking trip between Štrbské pleso and Popradské pleso is one of the easiest hiking trails in High Tatras, suitable for tourists at every age. Gentle ascend and attractive views make this route a must-see in Slovak Tatra mountains. Entry to Slovak Tatra National Park (TANAP) is free of charge. Rescue actions in Slovakia are paid, so it’s recommended to buy insurance before going to the mountains. We left our car at Štrbské Pleso parking lot. We chose the closest one, just right next to the boom barrier. One day costs 5.5 EUR, there’s a nearby ticket machine. Then, we went to električka tram station and bought a ticket to get to „Popradské pleso” stop (1.5 EUR). It’s just one stop, so if you don’t mind hiking on an asphalt road, you may also take a walk - it takes about half an hour to get there on foot. Actually, the direction of hiking doesn’t make much difference, because there are no difficult or steep sections. It’s allowed to hike with dogs in TANAP, so this route should be enjoyable if you want to walk with your pet. Asphalt road leading to Popradské pleso is also a bike trail. Because it’s rather steep, it’s recommended for advanced cyclists. The trail leading from Popradské pleso to Symbolic Cemetery is closed between January 1st and June 15th. Električka tram ticket between Štrbské Pleso and Popradské pleso costs 1.5 EUR. The timetable is available here. → Bystrá lávka trail - one of the best hiking trails in High Tatras. Exciting loop trail which starts and finishes right next to Štrbské Pleso. → Western Tatra mountains in Slovakia- a bit lower mounts, but equally beautiful. → Kriváň mountain in High Tatras - Slovak national mountain. For me, it was one of the most demanding hiking trails in High Tatras, but definitely worth the effort. → A few words about weather - weather in Tatra mountains is a serious matter which we need to consider before our hike.